New York: Gold reversed early losses to finish higher in New York on Wednesday, on surging crude prices and flight-to-quality buying as US equities slid on credit fears. Spot gold was quoted at $761.2-762 (Rs30,067.4-30,099) an ounce (28.35gm) at 2.15pm after falling as low as $753.90 against $759.20-760 late on Tuesday. Most active December gold on the Comex division of the New York Mercantile Exchange settled at $765.6 an ounce, up $2.5. It hit a session high of $767. “I would think that the turnaround in oil prices was a key part of it" because of the bullish crude inventory data, said Patrick Fearon, precious metals analyst at AG Edwards in St Louis. US crude closed 2.2% higher at $87.10 a barrel after a report showed that crude oil stocks fell far more than expected last week, according to data from the US Energy Information Administration. Gold often rises with higher energy prices because the yellow metal is used as a hedge against inflation. US stocks also fell broadly on Wednesday on lower corporate earnings and fears that the worst of the credit crisis may not be over. However, Fearon also cautioned that “the charts have looked a little sluggish recently. The slowdown in economic growth worldwide, that’s likely to hit in the coming month, is likely to eventually bring gold prices down". The dollar fell against the yen on Wednesday after a report showed that existing home sales in the US for September were weaker than expected, prompting investors to flee risky carry trade bets. The US housing market took a sharp turn for the worse in September as prices tumbled and sales of previously owned homes fell to a record low, battered by rising foreclosures and tighter lending standards. “We have a few down days, but then it’s been very resilient bouncing back up. Traders are looking at it as a buy-the-dip type market and they think it’s still going to head up," one New York precious metals dealer said. Bart Melek, global commodity strategist at BMO Capital Markets in Toronto, told clients in a note that a dollar rally on Monday left the precious metals somewhat oversold. Melek said non-commercial gold speculative net long positions surged to a record high last week on the Comex, reflecting inflation concerns. AG Edwards’ Fearon said, “Given the strong speculative interest recently, gold has already been driven up pretty high. That often sets you up for a correction downwards." But analysts said gold should then resume its bull run towards $800 an ounce. In other bullion markets, the benchmark August 2008 gold futures on the Tokyo Commodity Exchange fell 12 yen (Rs4.20) a gm, or 0.4% to 2,810 yen. Analysts said US new homes sales figures on Thursday will be closely watched. Weaker than expected data may point to a further deterioration in the housing market and increase the chances of more interest rate cuts this year. A lower rate might prompt investors to exit the currency market and invest in alternative assets, including gold. In India, gold prices moved up by Rs70 to close at Rs9,920 per 10gm on the bullion market on Thursday, on heavy buying by stockists triggered by a firm trend in international markets. 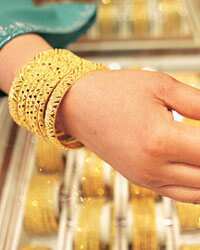 The market further gathered momentum as Diwali, a festival of buying gold jewellery and silver coins, is approaching. Atul Prakash in London and PTI contributed to this story.